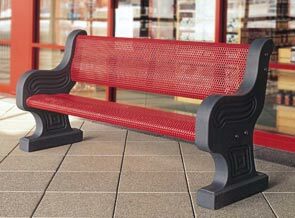 This 6' Metal-ArmorSM Coated Steel park bench features a contoured seat and back and gracefully designed concrete supports which provide extreme comfort and durability. The Metal-ArmorSM provides a clean, uniform finish without runs or drips. Metal-ArmorSM is an exclusive new one part process color treatment that beautifies and protects your park bench from abuse and the elements. It will also prohibit the growth of mold or bacteria. This environmentally safe process is FDA and USDA approved. 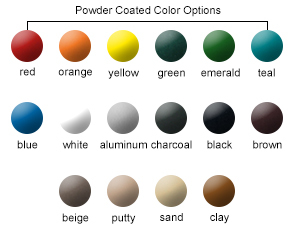 * 'Clear, Amber, & Charcoal' color upgrade options available with model numbers ending with '-CUS4'. ◊ 'Emerald & Blue' color upgrade options available with model numbers ending with '-CUS7'.